Our Services | Threads Embroidery & More! From embroidery to garment printing, to any other promotional material out there, we have everything you need to make a lasting impression. With great offers such as no minimum orders, no set up charge, and free shipping on embroidered apparel and accessories. Plus, no stitch counts on left chest and cap designs when ordering from our ONLINE APPAREL CATALOG. The list of accessories available and possibilities is endless! On top of of providing embroidery on items from our APPAREL CATALOG, we also provide an embroidery-only service where you can supply with an item for us to personalize. Learn more about all our EMBROIDERY SERVICES. On-site garment printing now offered in full color digital process, heat transfer printing, and also screen printing. 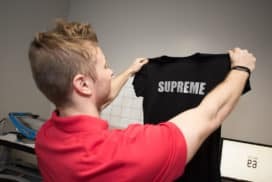 To learn more about the different types of garment printing, check out our GARMENT PRINTING page. 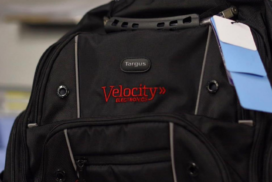 Anything you need customized with your corporate logo to make your brand stand out. Outerwear, pens, USBs, bags, coolers, knives, travel accessories and so much more! Check out our PROMOTIONAL CATALOG. Our motto is: "If you’ve got questions, we’ve got answers!"